Fresh, vibrant spring colour for your garden, patio or decking! A great mixture of tall tulips to give you a kaleidoscope of colour. Incredibly versatile, very strong and sturdy, with the classic tulip shape. Perfect for cut flower displays! They'll grow to approx. 60cm (2ft) tall. A great mixture of taller tulips approx. 45-50cm tall to give you a kaleidoscope of spring colour. They are incredibly versatile, very strong and sturdy and show off the classic, much loved tulip shape. Perfect for growing in beds and borders, this mix is an all-in-one solution to adding vibrant spring colour to your garden next year - maximum impact with minimum effort! We've put together a stunning mix of colour to create a real rainbow of tulips to stand loud and proud in your beds, borders or containers next year without you having to do anything other than plant and water. 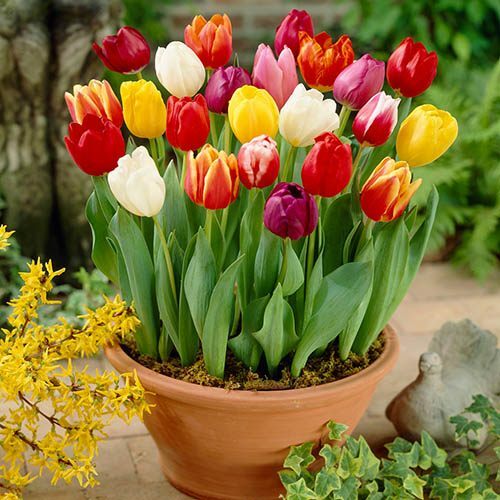 Tulips are one of the most popular bulbs, as they are are great planted with many different colour variations to give a fresh, vibrant spring colour to your garden, patio or decking but they also make great cut flowers to brighten up the house.